Is there no dust in America? This one I just got recently. I was at my friend Rashid's house and his roommate, Ikram, was very curious about the states. Rashid (who lived in the states for 6 years) and I both responded with, "Yes, yes it does." Ikram: "But then why do people wear shoes indoors?" Rashid: "Because Americans never need to walk outside. They go into their garage, then get into their car, drive to work, sit in an office, drive home, and are already inside." Ikram followed up with many other questions about clubbing ("you can't smoke inside??? How?") and money (see below), with nearly every inquiry and response ending with "Aaaahhh, OK."
On a related note, my Russian teacher told me, "I used to think that Bishkek was a very dirty city. Then I went to Philadelphia." 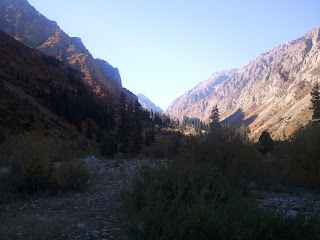 Also, many older Kyrgyz lament the demise of the Soviet Union and wax nostalgic about how clean and well-kept the roads were and how much better off everyone was back then. The only thing they say is better now is that they have more freedom to move around and travel. 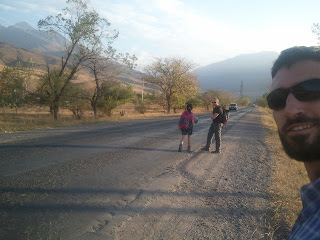 There is a definite sense among most people whom I've met in Central Asia that America is a dangerous place. Several of the people I've met refuse to travel to America because they are afraid they could get shot without warning. The idea that someone could have a "trespassers will be shot" sign is unbelievable to most of them. I try to explain that it's not ALL that dangerous, but that yes, many, many people have guns. The next question is usually, "Why? That's so stupid and dangerous!" or "Why don't you/the government change the law?" I try to explain the culture of guns and the second amendment, but it's lost on most of the people with whom I've had this conversation. Invariably followed with something along the lines of, "Wow! That's so much!" Except for meat. American meat is cheap, apparently. What are some American traditions? I told them all about Thanksgiving and Halloween and Mothers' and Fathers' days. The best part was explaining the meaning behind "trick or treat!" What is different about American schools? No uniforms. After that, there's quite a range. There are definitely some schools in the states that probably have equal or lesser access to technology and resources than this school. Who are some famous presidents? Why are they famous? This one seemed to be more of a chance to show off what they knew about the presidents. One student told me that he wasn't satisfied with my answer about why Teddy Roosevelt was famous; I said because of the start of the National Park system, he was looking for "he built the Panama Canal". What is the biggest state? What industry is in your state? After telling them that Alaska was the biggest state, one student told me, "I think Texas is the biggest." What is the weather/nature like in the US? Yikes. Where? It's a big country. What animals are in your country? Why do you like teaching Biology? It's so boring! From what I heard from most of these students, their entire educational experience is via textbooks and memorization. 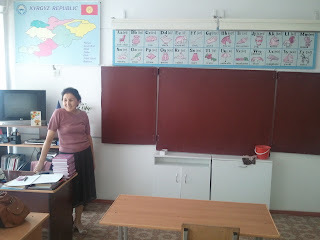 A few of them know that labs and activities and demonstrations are things that Americans have access to, and described it as the greatest "problem with Kyrgyz education." 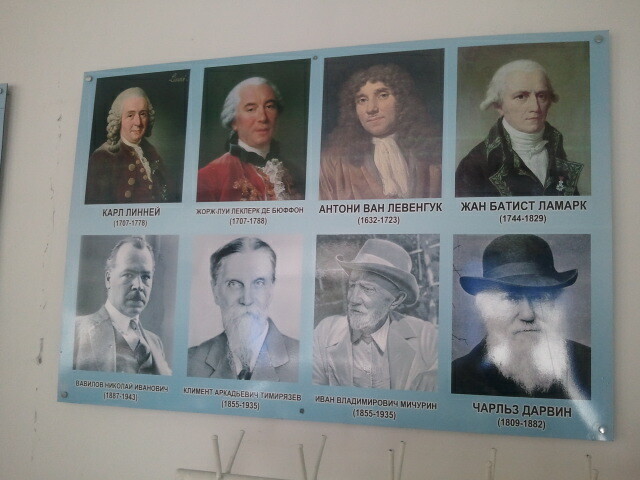 Famous biologists on the wall of the bio classroom. There was another portrait of Darwin (bottom right) on the other wall.